Ripple's Effect jumped to the number 3 spot in the Amazon Children's section on Saturday, May 17th. It's written by popular happiness researcher, author and speaker Shawn Achor and his sister, Amy Blankson. Shawn has been featured recently on Oprah's Super Soul Sunday sharing his research on the secrets of happiness. He joins us today to tell us how he's sharing those secrets with children through Ripple's Effect. 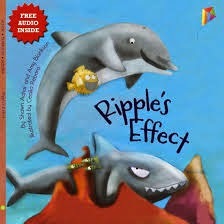 Ripple’s Effect is a delightful tale about a dolphin who teaches a shark to smile, and in the process, learns that happiness is a choice. Through this story, residents of an aquarium learn that sometimes a smile is all it takes to make a world of difference. I wrote this book with my sister, Amy Blankson, as a way to bring positive psychology principles to children. The book fights the common held belief that it takes big actions to make big changes. 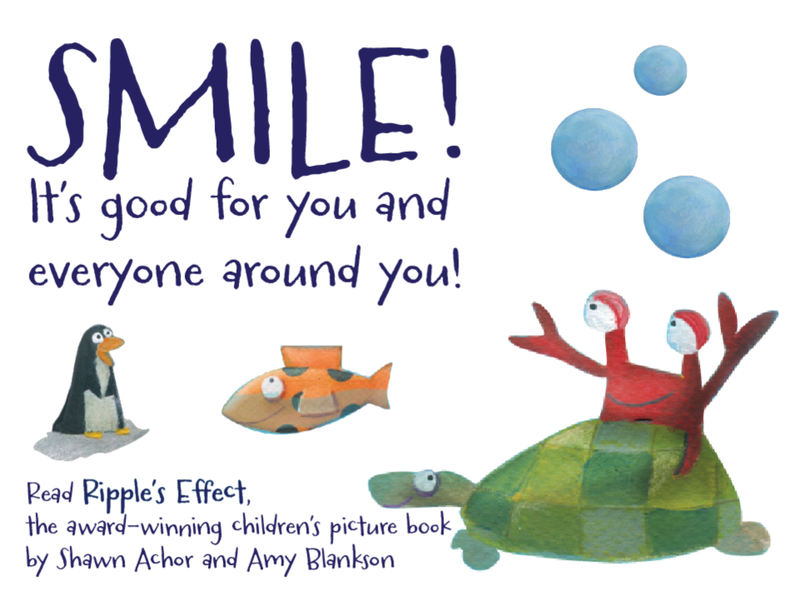 Ripple’s Effect can also be read in an anti-bullying light, as it emphasizes that we can smile in the face of a bully…and hopefully create happiness outside of ourselves. Amy and I wanted to write this book to share our company’s message with children, parents and teachers. We researched publishers and found a wonderful fit in Little Pickle Press, with their selection of mindful children's titles and eco-friendly printing practices. We are thrilled to watch the success that Ripple’s Effect has had in spreading the message across the world. In my day to day work, I speak to large corporate audiences about the power of The Happiness Advantage and every time, I get asked how to brings these principles and ideas home to their children and families. 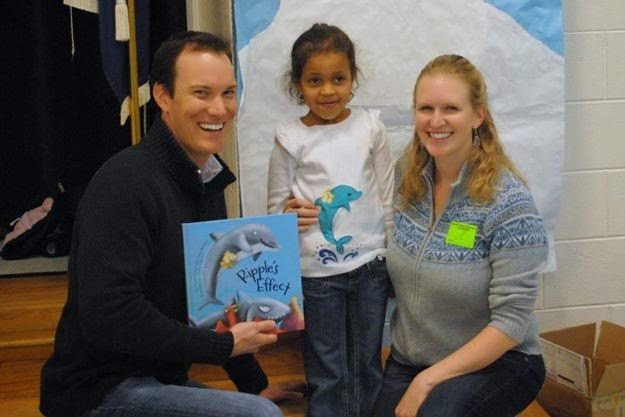 Our publisher Little Pickle Press also created a free curriculum for teachers to utilize the Ripple's Effect in their classrooms. My previous book (for adults) The Happiness Advantage was published in eBook form, so when the publisher suggested an ebook format for this book, it made complete sense. Seeing the colorful drawings come alive on a digital screen and hearing my sister's voice read the story aloud has been fun to watch as well! In the studies I’ve read, reading comprehension is best reinforced with thoughtful questions and discussion of a story. I believe that this can happen with either e-books or hard copies, but e-books often require more intentionality on the part of the parent as the child holds the reading device and the parent may not always be watching the screen to know what they are reading. As an uncle at the time, and now as a parent, I believe we wrote Ripple’s Effect in a manner that is conducive to family or classroom discussion about positivity and happiness, and we encourage all parents and teachers to use the discussion questions at the end of the book to continue the conversation. We wrote this book for children ages 4-8 as an introduction to principles of positive psychology. Our goal was to empower young people to make a choice about how they interact with the world around them. At one author's reading, a child announced to me proudly, "I was born mean!" My heart dropped because this five-year old child believed that about himself and had received some kind of reinforcement that that behavior was good...that it made him tougher or cooler. I chatted with him for a while after the reading and thoroughly enjoyed watching him transition to not only to smiling but to brainstorming ways to make others smile and giving me a fist bump. Children are so impressionable and it doesn't take much to turn their world around and inspire them for years to come. It is our hope that our book will do that for children around the world. I just published my second business title, Before Happiness and continue to work as a speaker and happiness researcher, although I’ve prioritized my latest job of being a new dad. Our team has lots of ideas for additional childrens' books that bring positive psychology principles to children, so we hope the ePublishing world continues to grow and support books with unique messages like ours. Learn more about Shawn and Amy by following them on Facebook. Here are the links: Shawn's Facebook and Amy's Facebook. Find out more about their work in the field of happiness at their website. See the latest Kids' EBook Bestseller List for more top ten e-format authors and their books. It's usually updated every Saturday morning. This week I've updated it on Friday evening, since I'm heading out early on Saturday for a writers' conference. On Saturday, May 10th, author Lynn Maslen Kertell had TWO e-books in the Kindle top ten for children. 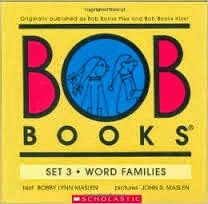 Bob Books Sight Words: Kindergarten and Bob Books Set 3: Word Families hit the number 6 and 10 spots respectively. 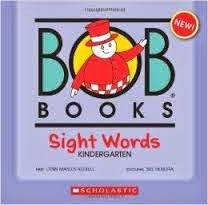 The award winning Bob Books series of learn-to-read books began decades ago and they continue to be popular with youngsters, year after year. And now it's obvious that children are enjoying the e-book versions in addition to the printed books. Lynn joins us today to tell us the story of Bob Books and their e-format success. First, tell us about Bob Books. There are now eleven sets of Bob Books. The first three sets were self-published by Bobby and John Maslen almost 40 years ago. After teaching school for 13 years, Bobby had strong ideas about how to help very young children (3-6 years old) begin reading. She wrote Bob Books based on her teaching experience, and eventually moved from teaching to being a full time book publisher. When their success become overwhelming, the Maslens partnered with highly respected Scholastic Inc., who remains their publisher to this day. Bobby’s daughter Lynn has taken over the family tradition and written the next six sets of Bob Books. She carries on the Bob Books promise of writing stories that are fun and funny, and build early success for beginning readers. Bob Books have been beloved by teachers, librarians, and parents of beginning readers for 40 years. We are happy to offer a beautiful digital edition of our books so that they are available in your favorite media, whether digital or print. A lot of our marketing is based on word of mouth. We appreciate and love Parenting Bloggers. We know a strong community exists in the mom and dad blog space – even though some have never met each other, they are trusted and close friends! We are very active on social media and listen to what others are saying via Facebook, Twitter and Google+. We often research blog posts and bloggers that write about us to see their feedback. We also participate on Pinterest and carefully curate learning to read activities from amazing bloggers. We see social media as a great platform to listen and share, both our products and content from bloggers and news sources that we love. Kids love digital media because it's interesting and new. We have combined the digital media platform with our Bob Books content to make learning to read easy and fun. It's a win-win of fun and content. Our target audience is 3 to 6-year-olds, and their parents, grandparents, teachers and friends. The e-format is great because it is so portable. You can bring an entire library with you – in the car, to an appointment. With one simple device, kids can share their reading success with Grandma or a friend. Parents who have purchased several sets of Bob Books will also find the clean up is faster! This question deserves a much longer answer than I can give here. The plus side of digital for kids is the interactivity. With devices that respond, kids get instant feedback, and they are drawn into the experience and stay engaged. It is SO important that the program be high quality, and that the interactivity is educational or promotes growth or self awareness is some way. Bob Books' two apps help kids sound out and and spell words, so they’re learning while playing a game. The minus is that getting out and doing something is so important for kids to learn who they are and how they fit in the world. Playing teaches kids problem solving, social skills, persistence, creativity. These can be lost in the structured digital environment where there are a limited number of right answers. 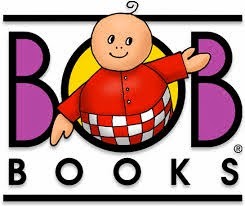 Learn more about Bob Books at the website or by following them on Facebook, Google+, Twitter or Pinterest. On May 3rd, Sweet Reckoning by Wendy Higgins hit the number 1 spot in the Kids' section of the Barnes and Nobel Nook store. 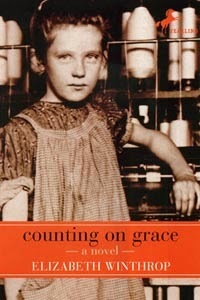 Her book went on to stay in the top ten for two more weeks. Wendy is a USA Today and New York Times bestselling author, and Sweet Reckoning is the third book in The Sweet Trilogy. 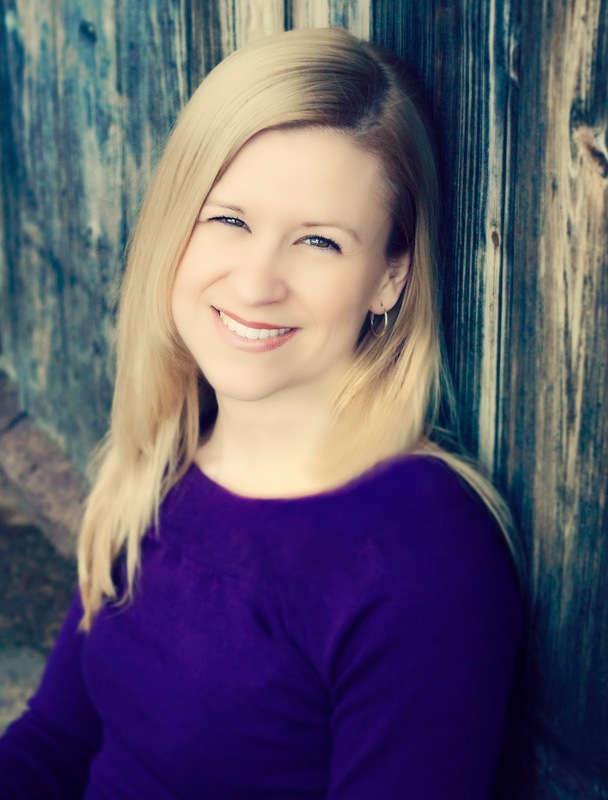 Welcome to the blog, Wendy! First, can you tell us what your best selling book is about? The Sweet Trilogy (Sweet Evil, Sweet Peril, and Sweet Reckoning) is about the children of demons, and the unfortunate works they are born to do on behalf of their evil fathers. The books are ultimately a love story, following Anna Whitt (a half-angel/half-demon) and Kaidan Rowe, son of the Duke of Lust as they try to rid the earth of the demons and gain their freedom. My Sweet Trilogy books are traditionally published over the past three years, and I've also independently published another YA fantasy called See Me in March of this year. Both journeys were vastly different - both had their positives and negatives - and overall I enjoyed both paths! Truly, word-of-mouth has been my biggest ally. Even though the books are with a big publisher, the marketing budget for my books is low, so I rely on Twitter, Facebook, Goodreads, and reviews posted to online retailers for publicity. Readers are amazing, always wanting to spread the word for books they love. It's a huge blessing to us authors! Find out more about Wendy and her books at her website, or by following her on Facebook, Twitter, or Goodreads.